Nintendo systems may be lacking the selling power of Minecraft, but a number of developers have been endeavouring to fill the gap. 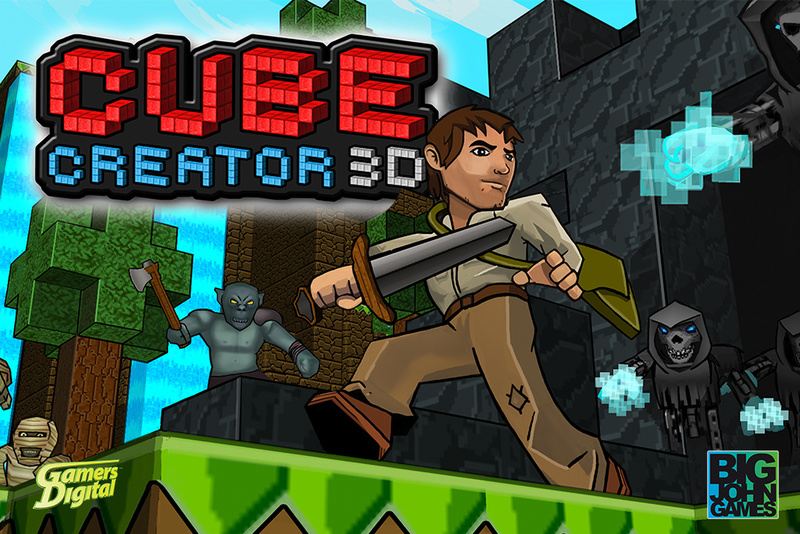 The latest to throw their hats into the ring are collaborators Big John Games and Gamers Digital, with Cube Creator 3D - it's arriving on the eShop in North America this week (23rd April). It'll have a discount price at launch of $4.99, and after two weeks it'll go up to $7.99. Cube Creator 3D aims to satisfy both camps in the world of Minecraft-style experiences - in Survival Mode you do the usual exploring, crafting and fighting to stay alive. Creation Mode will allow you to create your own worlds and share screens via Miiverse, with five environments to mess around with at launch and a promise of future updates. The game will support the Circle Pad Pro and New Nintendo 3DS / XL C-Stick, too. How well all of this ambition will convert into the final experience on 3DS is, of course, the key question. Big John Games has stated that the demo has been downloaded over 260,000 times - 'worlds' created in this one's Creation Mode can be transferred to the full version, notably. There are clearly plenty of people curious about the title - how many of those actually buy it will be interesting to see. Are any of you in North America tempted to pick this up in the Download Update this week? An ok Minecraft clone. I might buy it. I might wait for a review or two. I'll probably end up getting it though. Of all the minecraft clones we've seen, this one might be the best-looking. I have a 3DS but don't really give a carp about this one. If the Wii U knock off is good that will be great stuff however! I'm buying one for my son right off the bat. He enjoys the demo. If local multiplayer is added, I'll buy another two copies. No. Demo was terrible. Boring, bland, lifeless. Awful controls. When I want to play Minecraft, I'll play Minecraft. If I wanted a steak, I wouldn't eat a Slim Jim. I will say it does at least look nice, in fact it looks nice enough to make you wonder why no actual Minecraft, although of course MC has a lot more stuff going on 'under the hood' then just stacking up blocks. I played the demo and it wasn't bad. I'll be buying it and I'm sure my son as well. I hope there is local multi. I downloaded the demo out of curiosity, and I really hate the controls, so no buy for me. I liked the demo, hated the controls, but I made it work. Will be getting this! @redivgamer90 I really enjoyed it. @Chisel You'd eat a Slim-Jim if a steak wasn't available; Minecraft (the steak) isn't on the 3DS, so we'll have to settle with a clone (the Slim-Jim). I think I read that the full game allows you to customize controls. From their Facebook page, the controls will be improved, and customizable in the final release. You talking about your av? I have been waiting for this one. Will definitely buy it in two days. Its quite sad that Nintendo cant even manage to convince Mojang to port minecraft onto the wii u. it really does tell you all you need to know about the current state of Nintendo and the wii u.
Hopefully this game will follow in Minecraft's footsteps. The building and game mechanics are entertaining, but what really made minecraft a huge success was a development team that was committed to continuously update and reinvent the game. Redstone, pistons, horses, adventure mode... the list goes on... Unfortunately, so many developers are driven by suits looking for stellar reviews and immediate profits that they tend to always pull the plug way too early.